From classic white sneakers to the highly sought-after limited collaboration pieces, sussing out the right pair of kicks today is looking more and more like a full-time chore. Let’s face it, men love their sneakers. They’re important wardrobe staples along with your denims and white tee. Whether you’re going for the “sporty with a luxury edge” look or a sharp business casual ensemble, here are six of the popular sneakers everyone is talking about. These eye-catching Converse X Undercover sneakers are available in 4 vivid colours. Comes with the quintessential high-gloss toe box and matching colors on the contrasting toe bumpers, and vintage canvas. Retails for $180. Coach’ s latest offerings feature the artwork of 5 global artists – Michael Ng from Singapore, Sawako Kageyama from Japan, Dong Jin from China, and Eric Inkala and GIZ from the USA. Each artist combined their signature styles with the brand’s aesthetics (in this case, the Coach signature “C” monogram) to come up with this limited series of original artwork. Retails for $425. This handsome B01 trainer by Dior Homme is made from black and white smooth calfskin, black suede calfskin with multiple patches (printed “Dior Homme B01” logo on the outward-facing sides). A modern classic. Retails for $1,100. Dunhill’s Radial Runner sneakers are reminiscent of its AW18 theme of formal tailoring with a relaxed attitude. Pair these ‘Radial Runner’ sneakers with a button-up shirt and dress pants for a classy and chic look. Retails for $750. If you’re going for that sporty and smart look, slip on a pair of the Prada Mechano Crepe-effect leather sneakers. The stylish sneaker with the logo on the strap and rubber eyelets instantly adds a sporty (with a definite luxury edge) feel to your ensemble. Retails for $1,400. 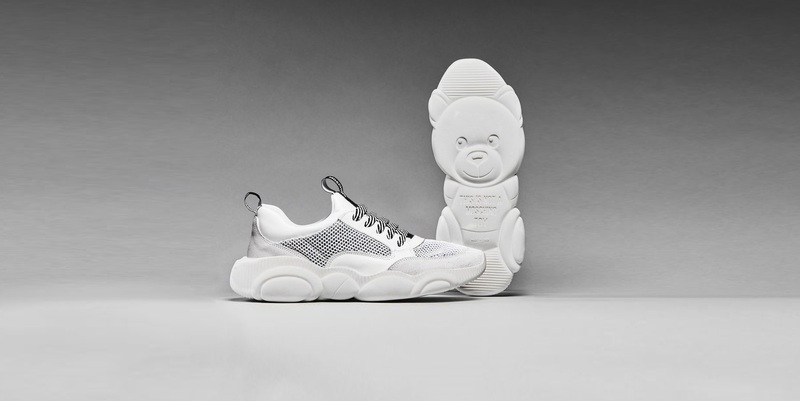 The lace-up sneakers in mesh, calfskin and split leather featuring the new Teddy sole in the shape of Moschino Teddy Bear is a latest lovechild from Jeremy Scott. It was launched as women’s sneakers – but we’re getting a lot of questions from our adventurous male readers about this charming new pair. Hey, what did we say about gender-neutral dressing? Retails for $660.